Campsite la Riviere is a small 4 star family friendly campsite that is located on the banks of the Vezere river. Occupying a wonderful position amidst the stunning Dordogne countryside, Campsite la Riviere is just a 10 minute walk from the centre of Les-Eyzies-de-Tayac which lies on the opposite side of the river. 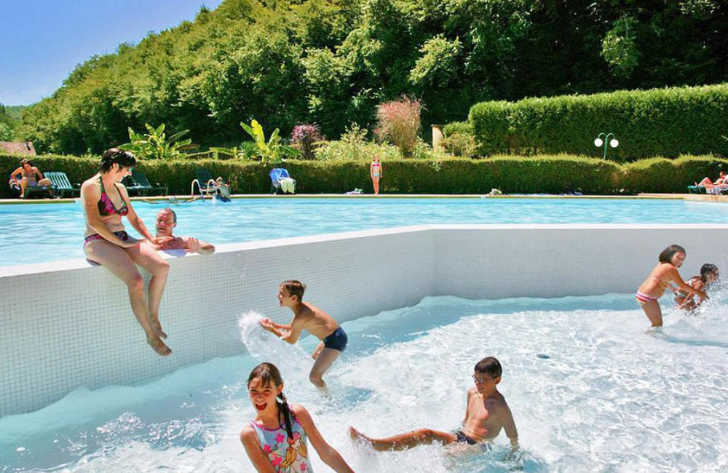 Campsite la Riviere is a perfect campsite for a number of reasons. Firstly, if you’re active then there are a number of great sporting activities available such as cycling, walking, horse riding and canoeing. Secondly, if you want to see all the region has to offer then it’s the perfect base from which you can explore the surrounding area. Lastly, if you just want to relax and recharge your batteries then where better than in the heart of the stunning countryside. Les-Eyzies-de-Tayac is well know for its unique prehistoric history. In 1979 it was designated as a UNESCO World Heritage site due to its series of prehistoric rock dwellings where a number of significant finds and extensive wall drawings were located. The town is now home to the National Museum of Pre History which is well worth visiting. Also in the town you’ll be able to find everything you’ll need whilst on holiday including a pharmacy, banks, grocery shops and other shops and restaurants. If you love to lazy around the pool during the heat of the day then there’s a strong chance you’ll like Campsite le Riviere. On site you’ll discover an infinity swimming pool, heated pool and separate paddling pool for smaller children. There’s also an attractive sun terrance where you can sit back and relax whilst the kids are playing. Even though Campsite la Riviere is a relatively small site there are still a good range of on site activities and facilities to ensure you have a fabulous holiday. On site activities at Campsite la Riviere include table tennis, tennis, boules, cycle hire, canoes, kayaks, fishing and a playground. Facilities available at Campsite la Riviere include WIFI, restaurant, pizzeria, snack bar, takeaway, bar, groceries, animation team, games room, tv room, washers and dryers. Accommodation at Campsite la Riviere campsite includes a range of 2 bedroom tents and mobile homes that are available from Suncamp.